The UM Hindi Team. Pictured left to right are Ruth Vanita, Margaret Grayson, Brandon Fulbrook, GG Weix, and Srijeet Mukherjee (current Hindi instructor). 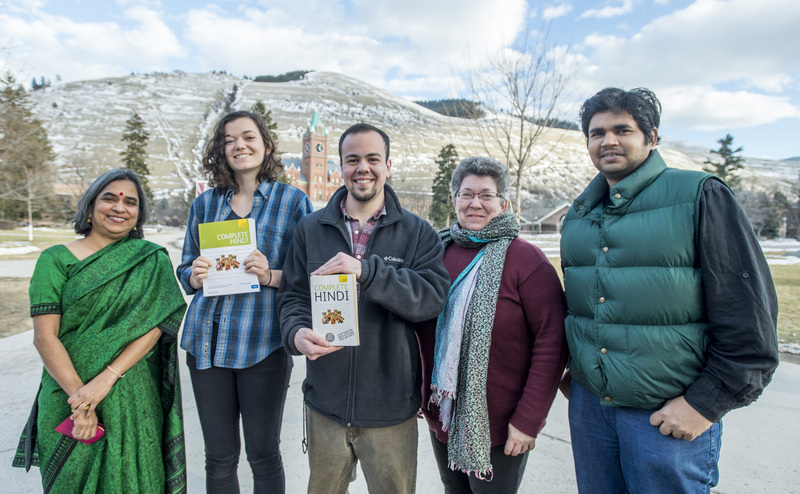 Congratulations to Brandon Fulbrook and Margaret Grayson, a pair of University of Montana students who are traveling to Jaipur, India this year to study Hindi language. Both these scholarship recipients will be participating in immersive language programs designed to expedite language fluency, not to mention provide cultural enrichment and experiences of a lifetime. 2018 marks the fourth year that Hindi has been taught at the South and Southeast Asian Studies program at UM. Professor Vanita said the Hindi language program may be small, but the excitement is large for its two biggest success stories this year. Hindi is taught by Fulbright instructors from India at the university. This year the instructor is Srijeet Mukherjee, supervised by Professor Vanita. Grayson is a student for whom language study is a natural fit. She is a something of a wordsmith herself, majoring in journalism at the university. Grayson is a managing editor at the Montana Kaimin and was previously an intern at the Missoula Independent this past summer and fall. Mukherjee is pleased by Grayson's progress. He said she started as an elementary level student with him being her first Hindi instructor. Being accurate in syntax while translating sentences from English to Hindi is one of the things Grayson has mastered, which takes other students some time to be accurate in, said Mukherjee. The Critical Language Scholarship (CLS) that Grayson received is part of a wider government initiative to multiply the number of Americans studying and mastering foreign languages that are critical to national security and economic prosperity. The program is sponsored by the United States Department of State’s Bureau of Educational and Cultural Affairs. It is supported by American Councils for International Education. While the CLS scholarship has a geo-political bent, what drew Fulbrook to applying for his American Institute of Indian Studies scholarship, was its wide scope and diversity. He said one can study humanities, religion, anthropology, and linguistics. Fulbrook has won a 2018-19 AIIS scholarship to study Hindi in India for nine months. He is a junior majoring in political science at Missoula College. Fulbrook is ecstatic about his departure this September. Call Him Keshav as he is traveling around Jaipur. Keshav is the name Fulbrook was christened in a name-giving ceremony in his hometown of Las Vegas, Nevada. The actual name of the ceremony is Namakarana Samskara. It was a private ceremony at the Hindu Temple and Jain Center of Las Vegas with the pandit (priest). Fulbrook said in his formative years he grew up in a few different households. “I was raised in Catholic, Mormon, and Evangelical Christian households. I pursued new age spirituality before I was thirteen,” he explained. Then at 19 he met a friend teaching a class on the Bhagavad Gita at the Open Way Mindfulness Center in Missoula. It was a revelatory experience. Having already a strong language skill set, Fulbrook is prepared for Jaipur, and for travel to other parts of India. On his winter break between semesters, he intends to participate in the Kumbh Mela festival in Allahabad. Later in the spring, he plans to go south to Chennai. Upon his return to the United States in April, Fulbrook plans on graduating and pursuing a graduate degree in law. He said he will potentially use his language skill to work for an NGO, or advise foreign policy and diplomacy that is constructive. Mukherjee, who instructs Fulbrook, said the latter has been learning informally for over five years now and he also watches Indian cartoons and a few Indian sitcoms on YouTube. Professor Ruth Vanita said the American Institute of Indian Studies offers summer, one semester and 9-month scholarships. There are also many Boren and CLS scholarships that students can apply for to continue their study of Hindi in India. These scholarships cover tuition, living expenses and air fare. Vanita said Hindi is a phonetic language (written exactly as spoken) and an Indo-European language, a first cousin of English. As a spoken language, Hindi is the same as Urdu, and is extremely useful for students of business, journalism, media studies (India has the largest film industry in the world), politics and economics. For more information, contact Ruth Vanita, professor, UM Liberal Studies Program, ruth.vanita@umontana.edu; GG Weix, professor, UM Department of Anthropology, gg.weix@mso.umt.edu; or call South And Southeast Asian Studies (SSEA) at (406) 241-5793.